Tony Lazorko died last August (2017) in Mesilla, New Mexico, just south of Las Cruces, where he had moved after he retired from a long career at newspapers in Philadelphia and St. Louis. He had worked at the Philadelphia Evening Bulletin from 1956-1982 and then as Art Director at the St. Louis Post-Dispatch from 1982-2000. 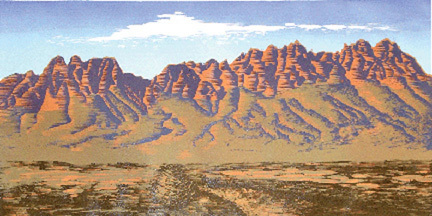 He moved to Mesilla and set up his printmaking studio with a new Takach press and focused his artistic attention almost exclusively on color woodcuts. We had the good fortune of visiting Tony several times at his Mesilla home and studio and learned from him that he had attended the Philadelphia Academy of Fine Arts for four years and was a working artist before the necessities of having a steady income for a growing family realigned his priorities. While studying at the Philadelphia Academy, he met fellow art student and his future wife, Marguerite. As his health deteriorated, Lazorko worked with Ivan Rincon who helped print his woodcuts, frame and ship them for his many exhibitions, and handle the variety of tasks that face an ambitious artist. Gallery | This entry was posted in AP/RC Artist and tagged Anthony Lazorko, AP/RC, artist, Artist Printmaker Research Collection, Artist Printmaker/Photographer Research Collection, Artist Prtinmaker Research Collection, contemporary art, Lazorko, Museum of Texas Tech University, New Mexico, Peter Briggs, printmaker, Printmaking, Prints, relief, Texas Tech Museum, woodcut. Bookmark the permalink. I was fortunate to call Tony “friend.” Seeing so many of his pieces in one place–other than his studio–is gratifying, indeed.